We congratulate you on your recent engagement. Please download the following marriage policies that guide us here at Emmanuel, and fill out the application that is available. You will be notified when your application is accepted and your first appointment with one of the clergy can be set up. 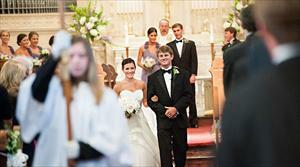 For more information on weddings at Emmanuel and to view our policies, please click here. To send your application electronically, click here. All pre-marriage counseling sessions will be set up between you and the Priest who will be working with you.